5 has always been my favorite digit. Factors of one end in the digits in the same order as counting numbers, 1, 2, 3 etc. Factors of nine go in reverse: 9, 8, 7 etc. But five keeps to itself, as far as factors go. It only consorts with zero: 5, 0, 5, 0, 5, 0. Where am I going with this? I’ve always stood alone myself, with my own particular interests. 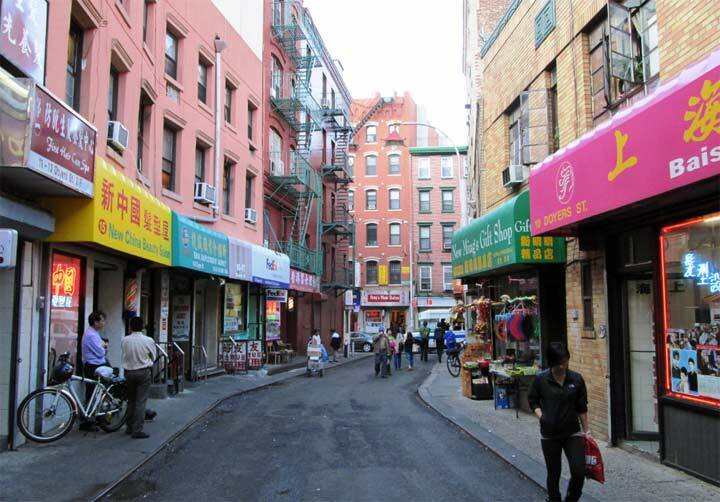 Forgotten NY was a pioneer when it began in March 1999; no other website showed NYC in this particular light, its secrets, little-known aspects with an emphasis on infrastructure. Perhaps FNY has been surpassed by other sites that make more money, or have bigger staffs and can cover more things, or have more financial support. But I will go as long as I can go. I was 41 when I began and just turned 60. 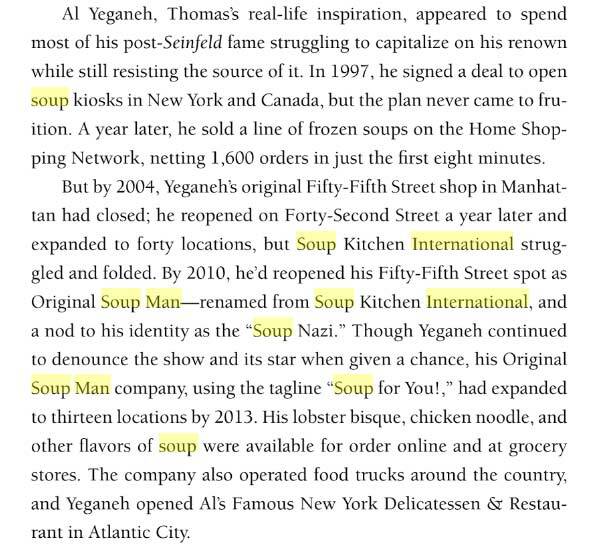 I still don’t think any site has quite the focus that Forgotten NY does. 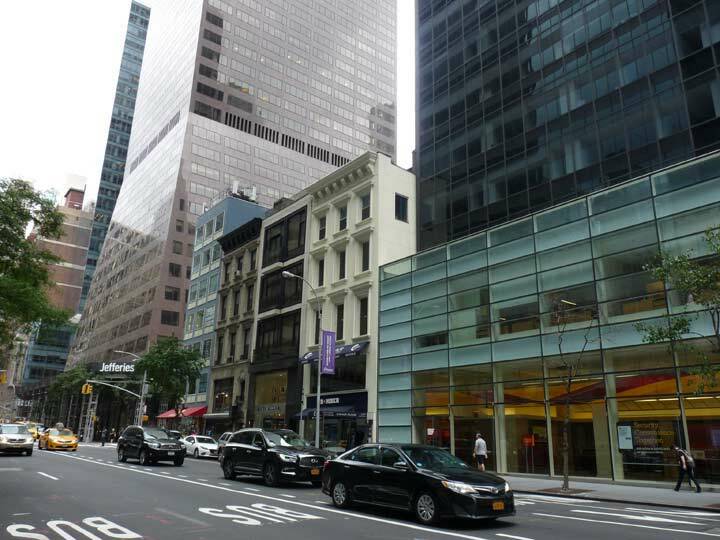 Last week I left off after walking up Park Avenue on one of the Summer Streets Saturdays and decided to turn left on East 55th, because I realize I hadn’t walked it at least the majority of it was far west as the Hudson, so was bound to find some new material. I don’t think I was disappointed. In the I Do Not Want What I Cannot Have department, the Ferrari Store is on the SW corner of Park and 55th. 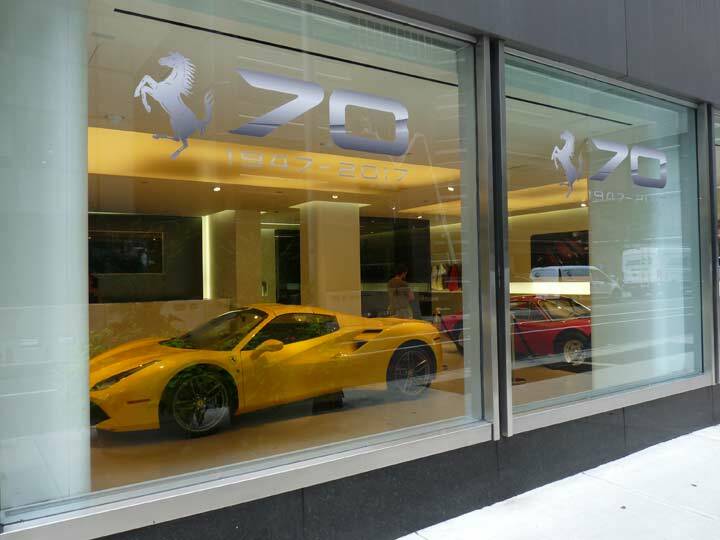 Despite the sports cars on display in the picture windows, this store actually deals with Ferrari-branded apparel, timepieces, and collectors’ items. The car manufacturer was founded in Modena, Italy by Enzo Ferrari in 1939 and at times, it has produced some of the most expensive cars in the world; in Formula One racing, Ferraris have won 16 championships. 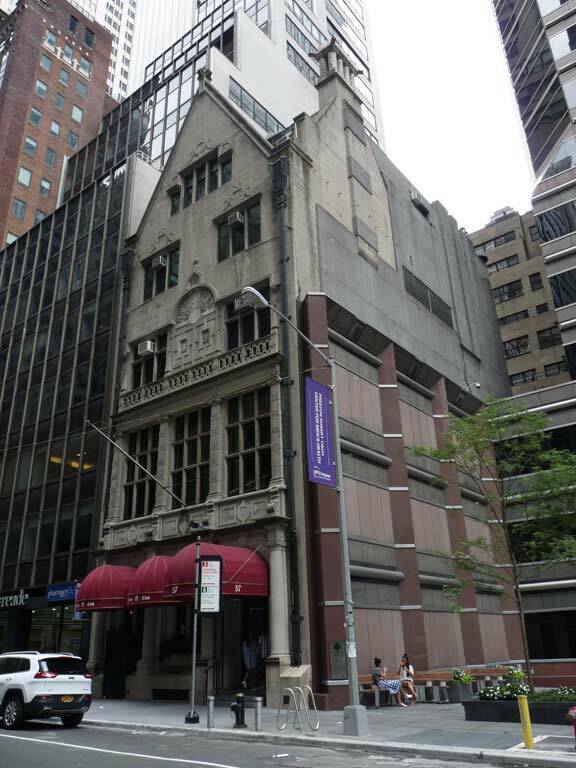 The Friars Club, located at 57 East 55th between Park and Madison, is a private showbiz club known for its annual good-natured, ribald ‘roasts’ in which the guest of honor, likely a comic of renown, is roasted over the coals. In 1904 press agents were doling out tickets to reporters to Broadway shows in the hopes that they would plug their clients in newspapers and magazines. They eventually noticed that not all of these reporters were legit. 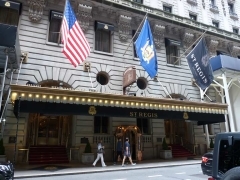 It became so frustrating for them that a band of 11 agents gathered together weekly at Browne’s Chophouse, in Manhattan, to discuss the problem. They dealt with it by setting up a blacklist. When the problem at hand was resolved they realized that they actually enjoyed these weekly meetings and continued to meet and just hang out together. They formed a club called the Press Agents Association. When the actors and musicians started to join them on their weekly get-togethers the group realized they needed a broader name to incorporate the ever-diversifying membership. The term Friars stems from the Latin “frater” meaning brother–the perfect name for a fraternal organization whose motto would soon become Prae Omnia Fraternitas (brotherhood forever). The Friars purchased this 1909 English Renaissance townhouse in 1957. The first “roast,” honoring French entertainer Maurice Chevalier, was held in 1949. The Friars were an all-male establishment until 1988, when Liza Minnelli joined. 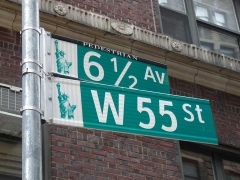 There had been a “Friars Way” street sign at Park and 55th, but it seems to have disappeared. 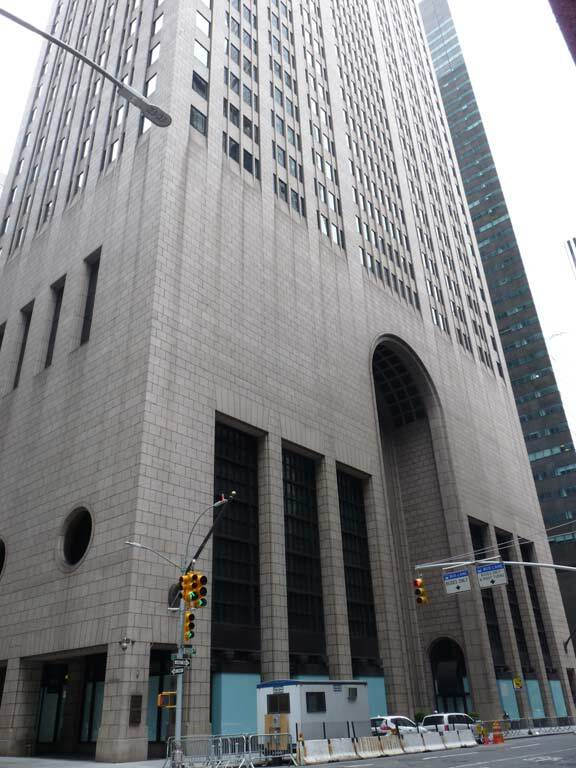 This massive tower at the NW corner of 550 Madison Avenue and East 55th with the 7-story entrance arch was built as the AT&T Headquarters in 1984 by a team of architects headed by Philip Johnson; its notched ‘Chippendale’ roof is instantly recognizable in aerial photographs of Midtown. It later became SONY headquarters in 1996. 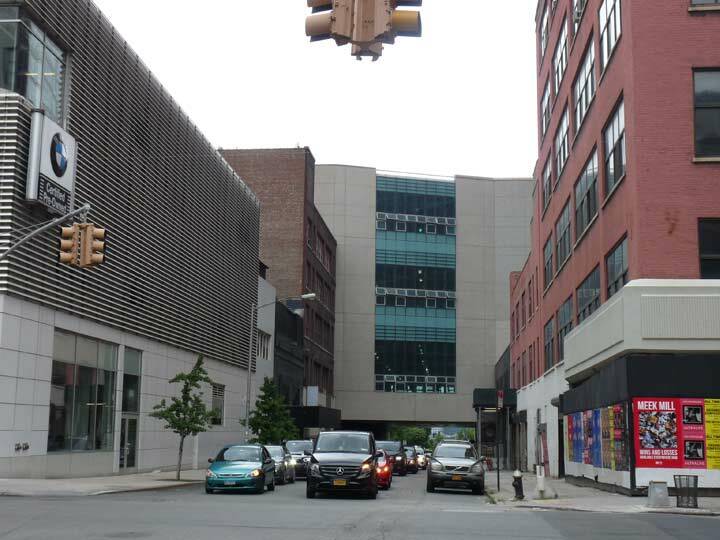 It was home to the SONY Wonder Technology Lab until 2013. The building can be somewhat polarizing — some are in awe of its rather daring and innovative entrance design, while others (like me) see it as rather Brutalist, but some like that school as well. East side of Madison between East 54th and 55th. 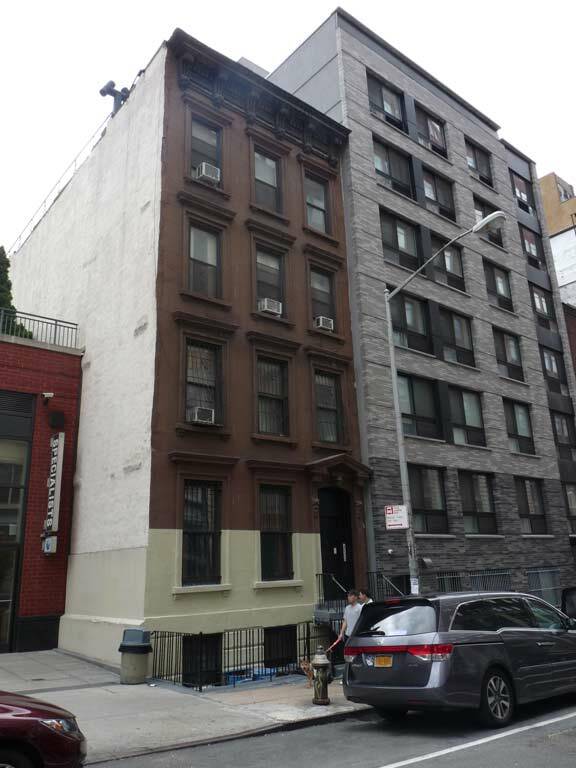 I noticed these three 3-story townhouses midblock, holdovers from the early 20th Century or perhaps late 19th. The 1982 Continental Illinois Center can be seen in the background. 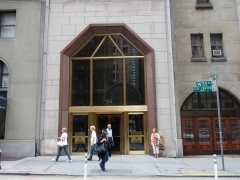 Though 551 Madison, on the northwest corner of East 55th, was constructed in 1922, it was renovated top to toe in 1982 and looks contemporary by comparison to other skyscrapers in the area. 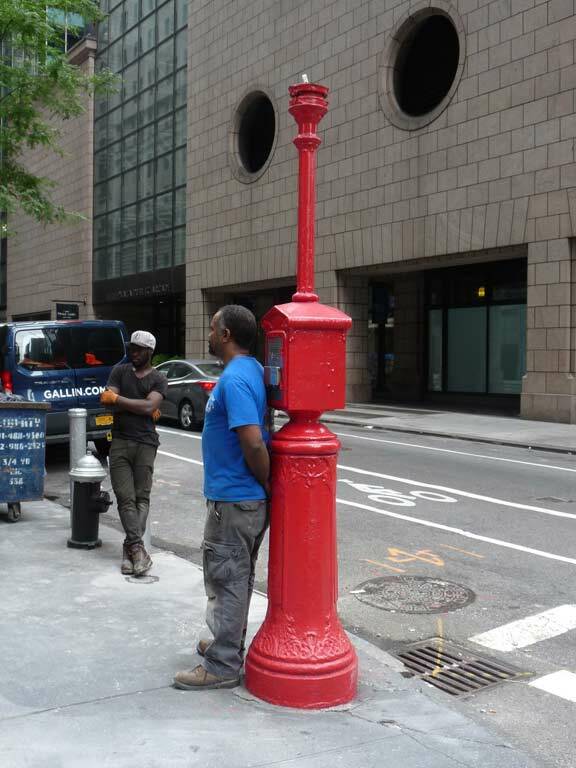 I had mentioned in the Park Avenue Summer Streets segment that the fire alarm at Park and 34th was the only such one that I know of that still had an indicator lightbulb still attached. This one, Madison and East 55th, still has the stanchion, but a missing bulb and reflector. It has recently gotten a new red paint job. Note 550 Madison’s porthole windows. 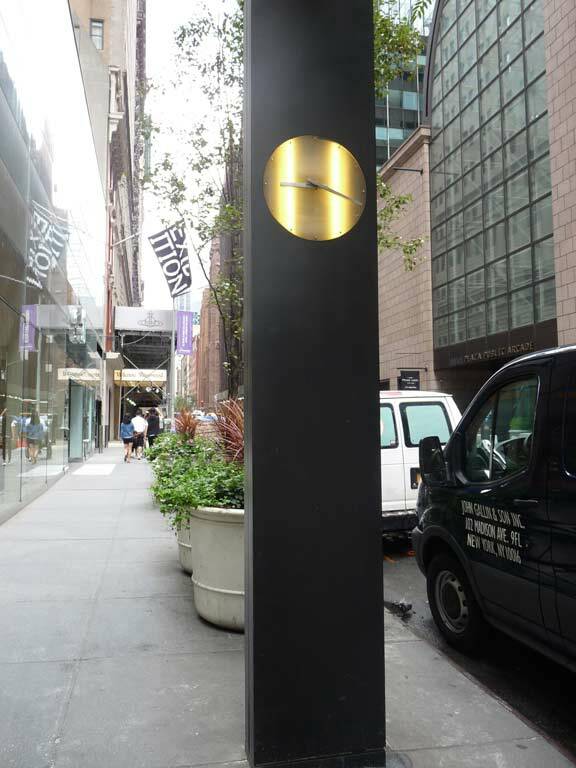 One of NYC’s more minimalist street clocks stands outside 540 Madison Avenue at the SW corner of East 55th. It resembles the monoliths in 2001: A Space Odyssey. 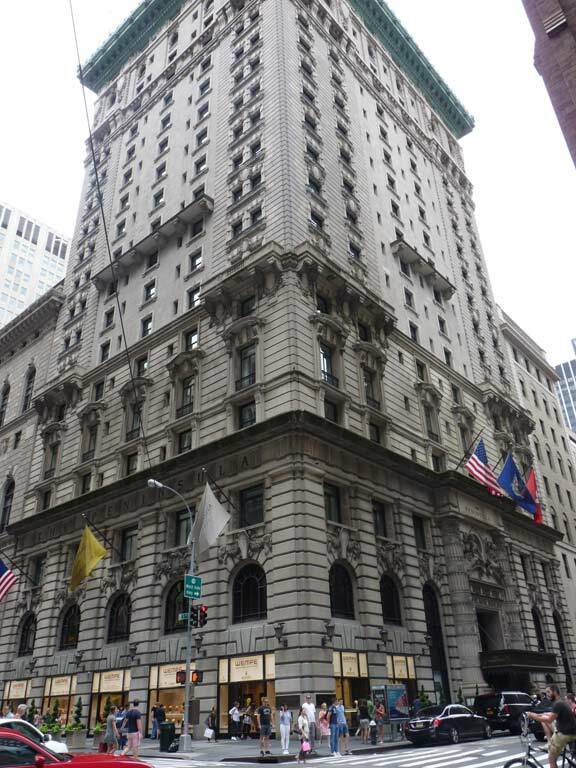 The clock probably was installed when 540 Madison went up in 1970 or during its renovation in 1999. The illuminated clock side is stopped, but the non-illuminated side is still telling time. 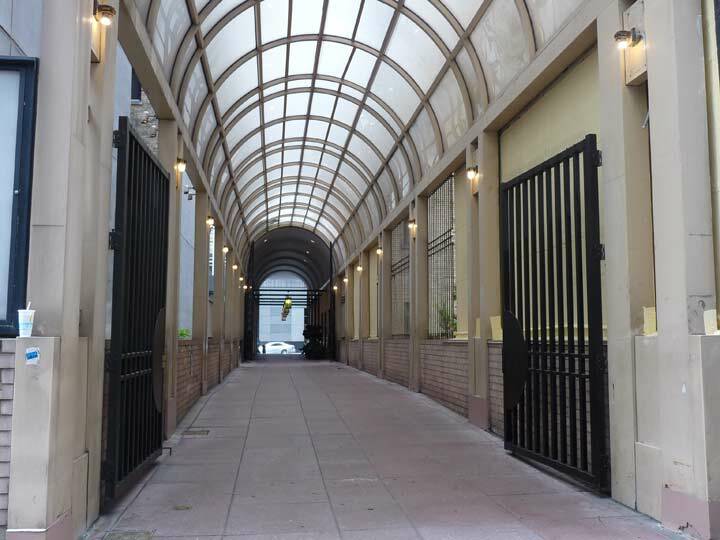 Side entrance of 550 Madison. 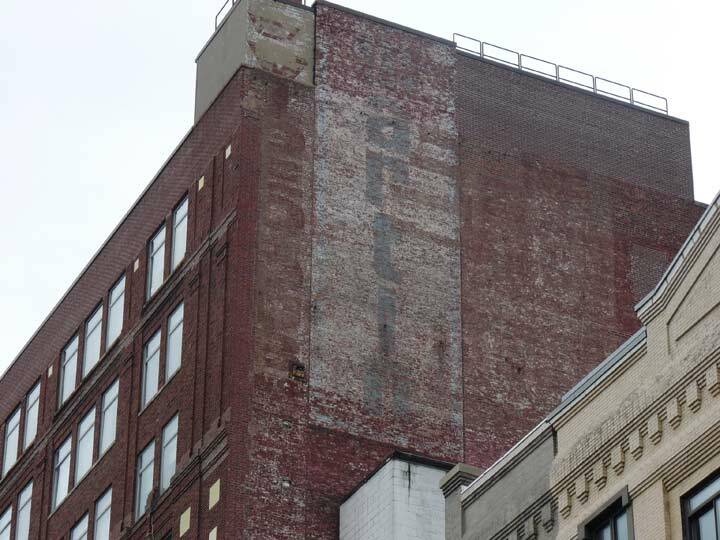 SONY sold the building in 2013, and the SONY over the entrance has been removed in a less-than-thorough manner. Another pair of holdouts at 16 and 14 East 55th Street, both Beaux-Arts style townhouses I estimate to be from around 1900. 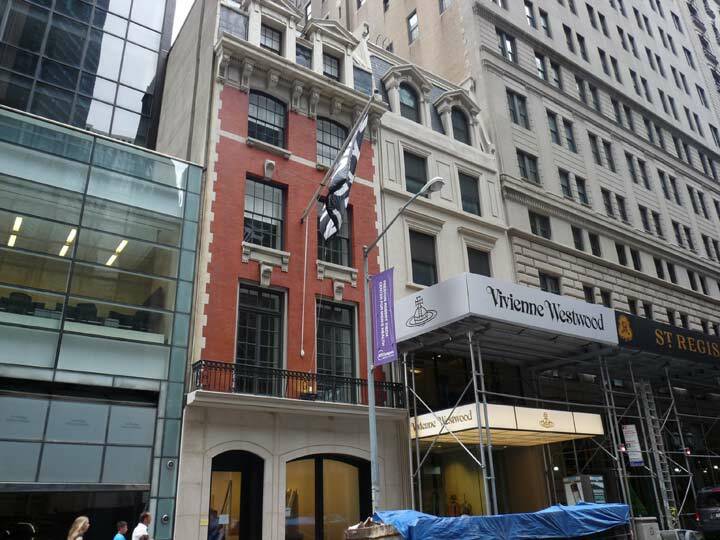 #16 is home to the Anton Kern Gallery; the flag on the pole says “EXHIBITION.” British fashion designer Vivienne Westwood purchased #14 in 2013 for her corporate HQ and retail store. 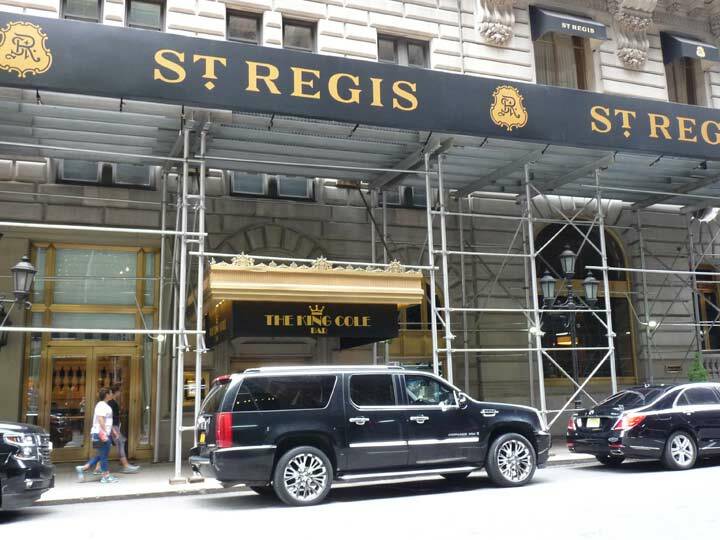 The St. Regis Hotel, 5th Avenue and East 55th, is one of the most famous hotels in NYC, and one of the most expensive to stay in. It was built in 1904 and named for an Adirondacks resort. 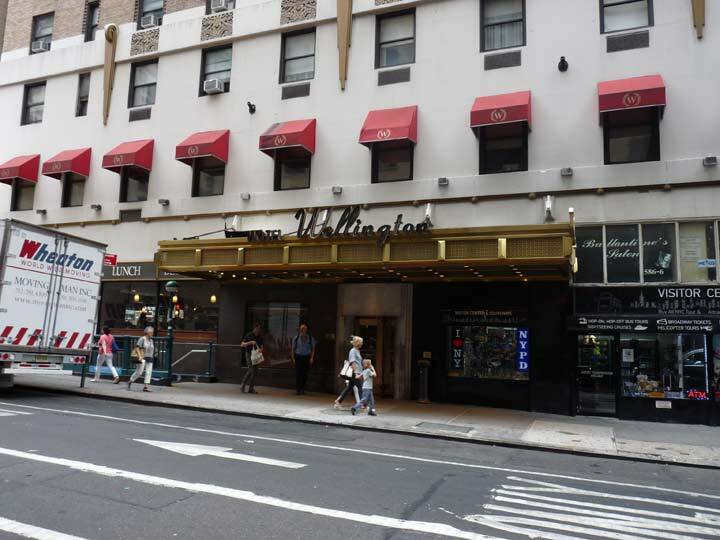 According to NY Songlines, it was among the first hotels to have air-conditioned rooms and its ballrooms had 47 Steinway pianos. Marilyn Monroe argued there with Joe DiMaggio over her subway grate scene in Seven Year Itch; in Taxi Driver, Travis Bickle picked up Betsy (Cybill Shepherd) for a date that did not go well. The King Cole Bar is famed for its wall mural, painted by Maxwell Parrish and installed in 1932, depicting the merry old soul. 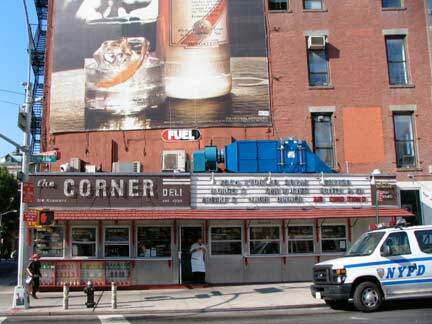 The first Bloody Mary was served there in 1934. 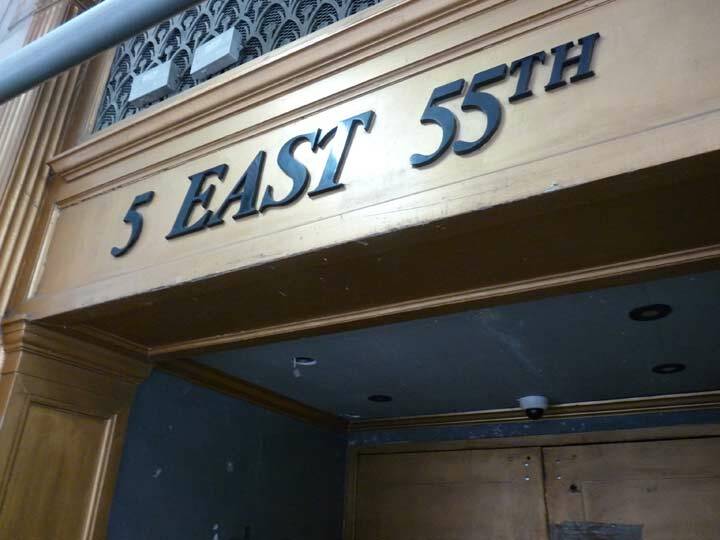 The 5s are wild at #5 East 55th, just off 5th Avenue. 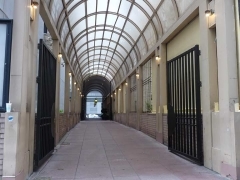 It is the side entrance of 711 5th Avenue, constructed in 1927 and the former home of Coca-Cola; Columbia Pictures; the Côte Basque restaurant; and the Disney Store. 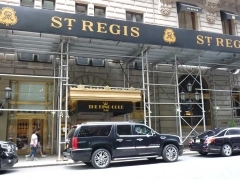 The St. Regis also has a set of 3-headed lamps on West 55th, though with the scaffolding this is the best shot I was able to get. 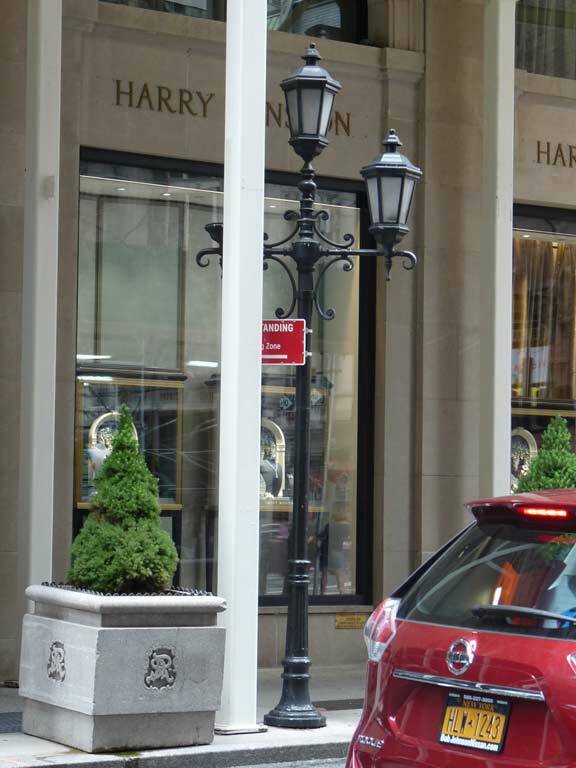 This shot was in front of the Harry Winston diamond emporium on the SE corner of 5th and 55th. The magnificently Beaux-Arts hotel The Peninsula, SW corner of 5th and 55th, was built in 1905 as the Hotel Gorham but quickly went bankrupt three years later when its restaurant and bar was prohibited from serving alcohol because of its proximity to the 5th Avenue Presbyterian Church (see below). Its successor hotels did better as the blue laws were revised. 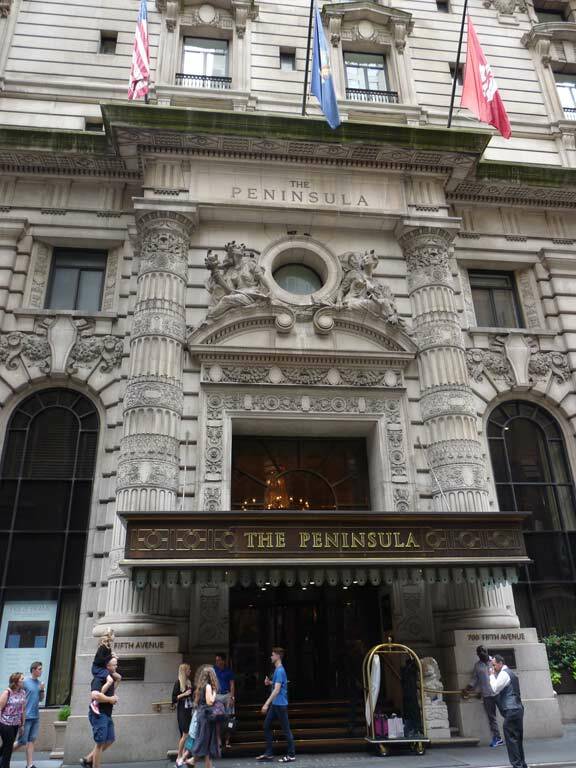 The hotel was re-sold in 1988 and renamed The Peninsula, whose names is spelled out in the Novarese font on the building. It’s one of the few fonts that has no italic capital letters. 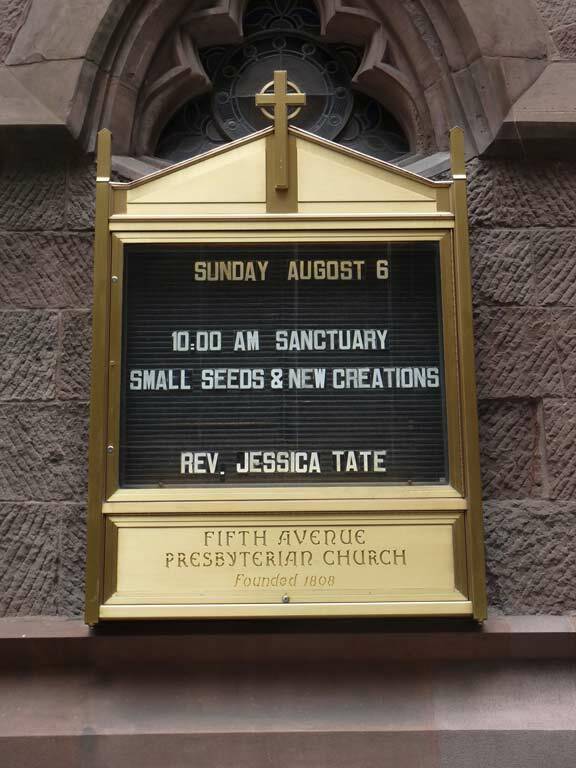 The Fifth Avenue Presbyterian Church congregation dates as far back as 1808, when it was instituted on Cedar Street in lower Manhattan. 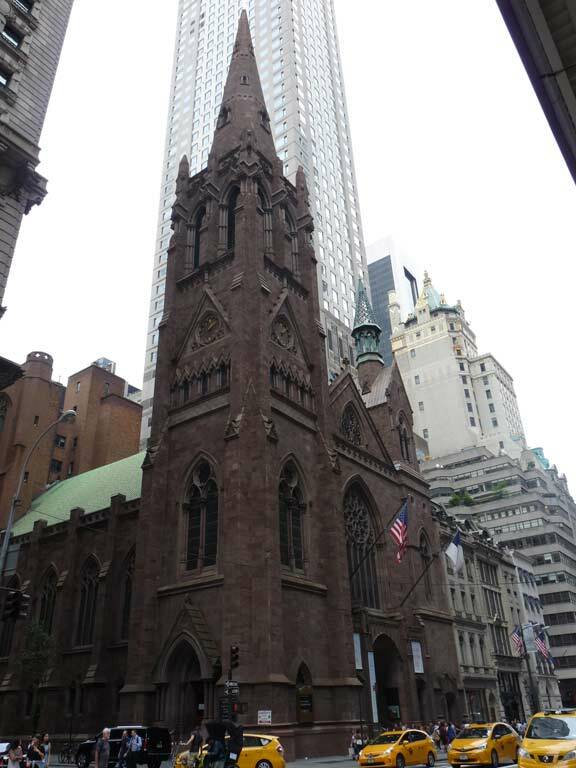 It built this tall-steepled Gothic church here on 55th and 5th in 1875, with German immigrant Carl Pfeiffer the architect. 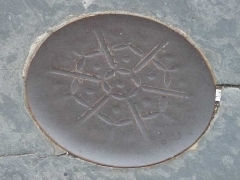 Pfeiffer’s engineering skills are evident in the technological innovations he introduced. Wooden louvers installed beneath the pews allowed warm air to rise into the Sanctuary on winter mornings from steam pipes in the basement. On warm days, enormous blocks of ice were delivered to the basement, where fans blew cooling air upward. The Sanctuary did not have modern air conditioning until 2003. 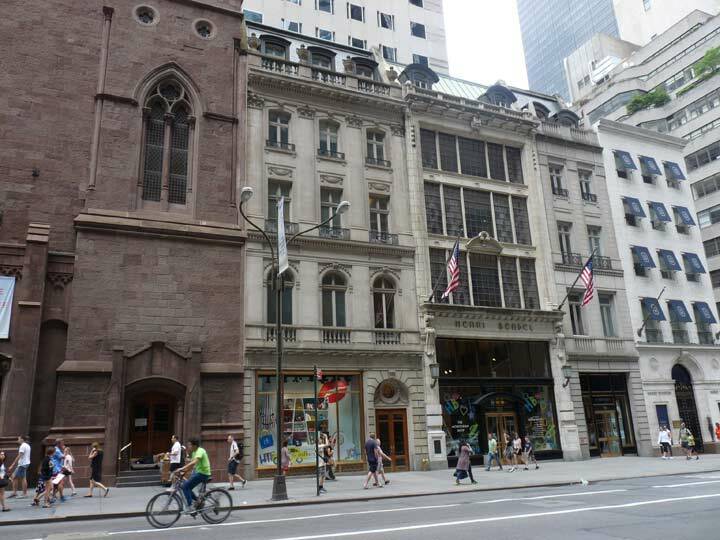 A midblock twin Donald Deskey stands between the 1875 5th Avenue Presbyterian Church (left) and the Henri Bendel boutique, a mecca for “Bendel girls” since 1895. 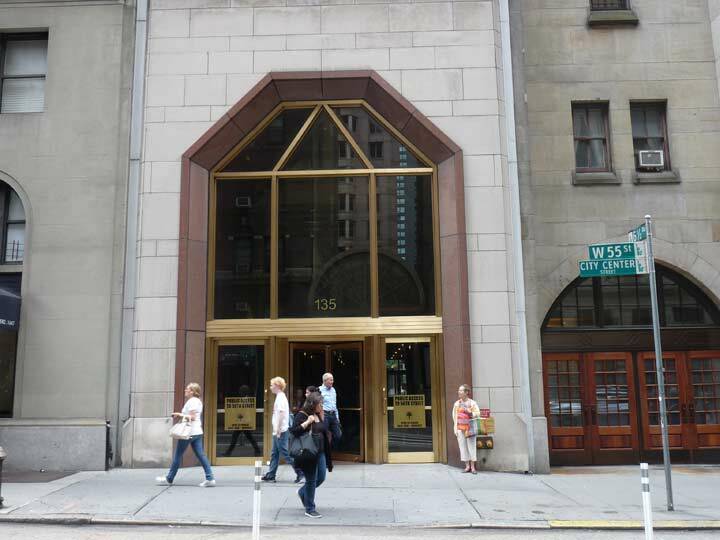 Just a handful of 5th Avenue’s copper-colored complement of 1965 twin Deskeys are still remaining. 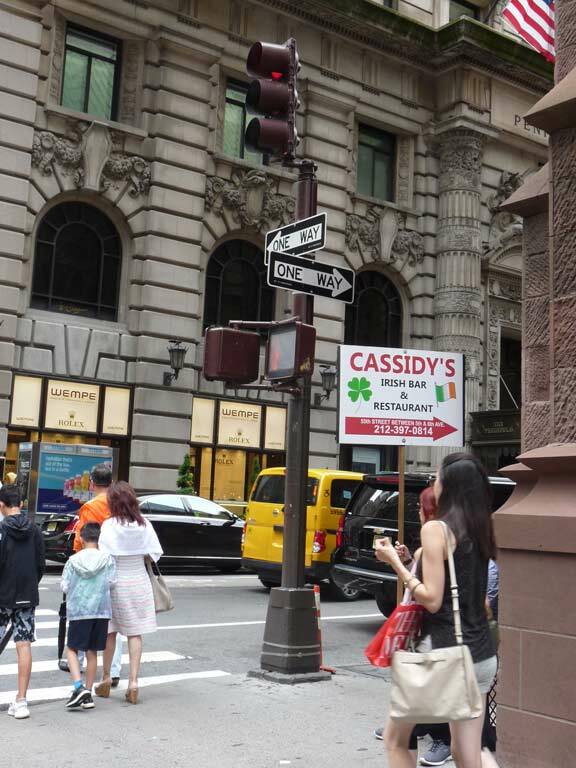 Nevertheless, 5th Avenue’s copper Deskeys supporting stoplights and pedestrian controls have fared better, with a decent number of them remaining. The stoplight is mounted here in a nonstandard fashion. 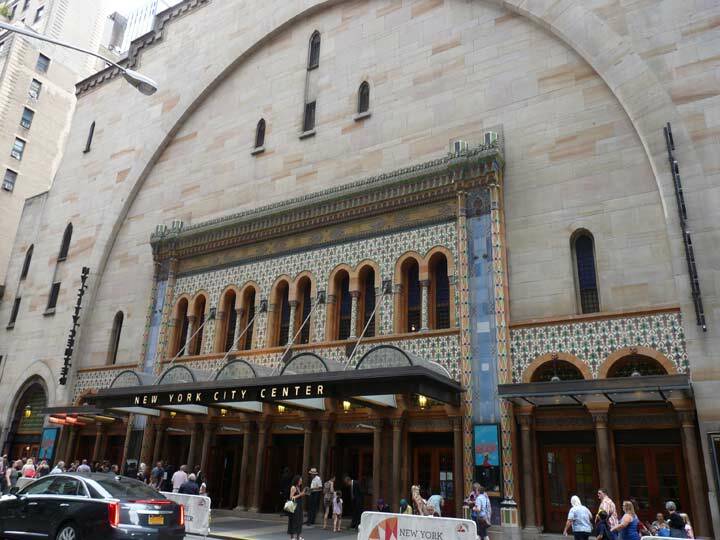 One of the more unusual buildings in Midtown, The Ancient Order of the Nobles of the Mystic Shrine was constructed in 1923 with a Moorish architectural scheme, but the Little Flower had different ideas for the place after the fezzed organization members moved out and made it into a city-owned performance space, NY City Center, in 1943. 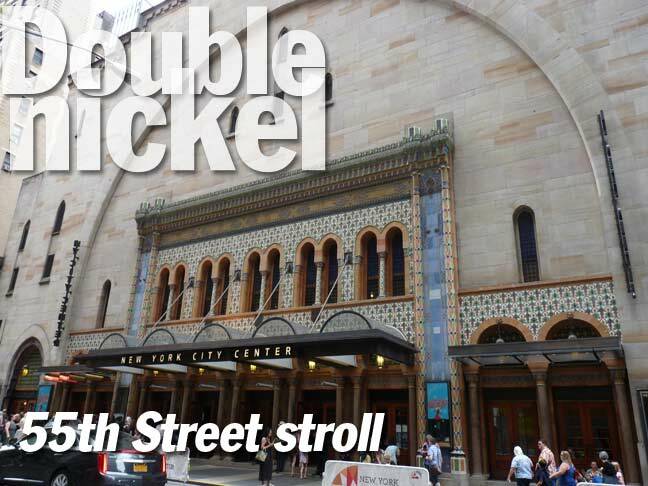 Over the years it has been home to the NYC Opera and NYC Ballet Company. When I passed by it was hosting the kids’ musical Really Rosie, a collaboration originally mounted in 1980 by author Maurice Sendak and popster Carole King. The revival lasted three days. 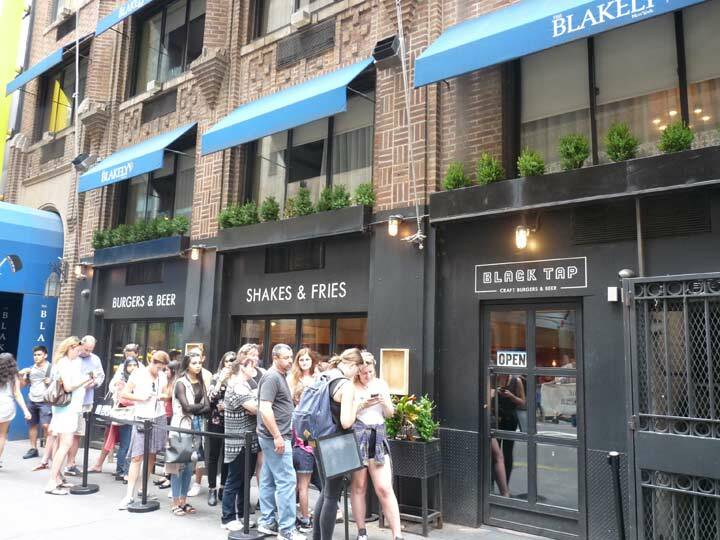 I pride myself on not being attuned to the zeitgeist, so I was taken aback by the line outside Black Tap Craft Burgers and Beer at #136 West 55th. Apparently the beer and burgers are only part of the story because the place is abuzz about its signature milk shakes. Since my blood sugar was a bit higher than advisable during my last doctor visit it may be just as well that I didn’t know. 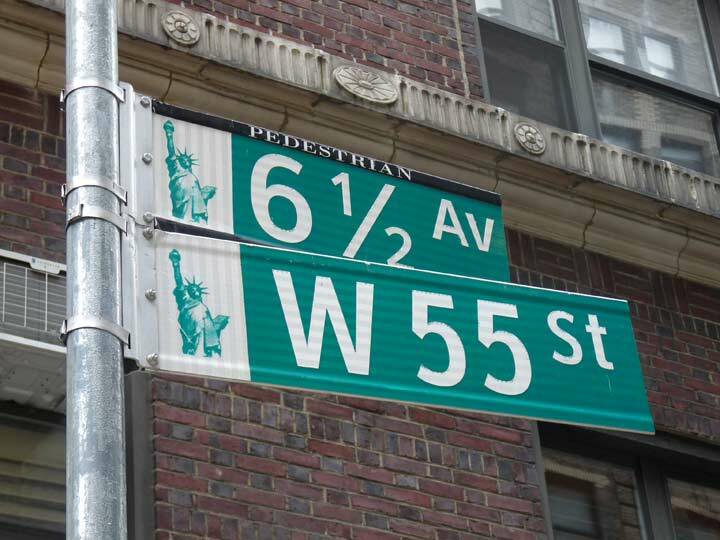 Recently the City has made the newest addition to its set of numbered avenues for over two centuries. 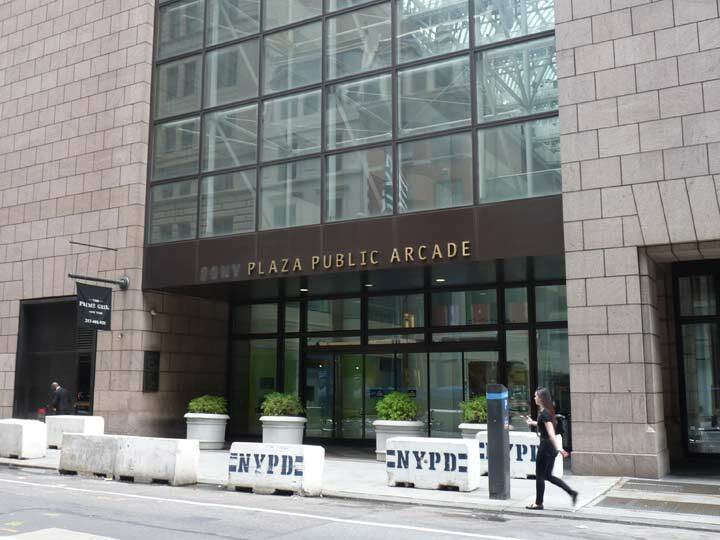 In 2012, a pedestrian-only strip, named 6-1/2 Avenue, was opened through existing open-air plazas and building lobbies, running from West 51st north to West 57th Streets between 6th and 7th Avenues. Traffic is halted by stop signs, and the streets are marked by green and white Department of Transportation street signs. This isn’t unprecedented; many municipalities have “half” streets, including Baltimore, in the Charles Village area between East 20th and 25th Streets. 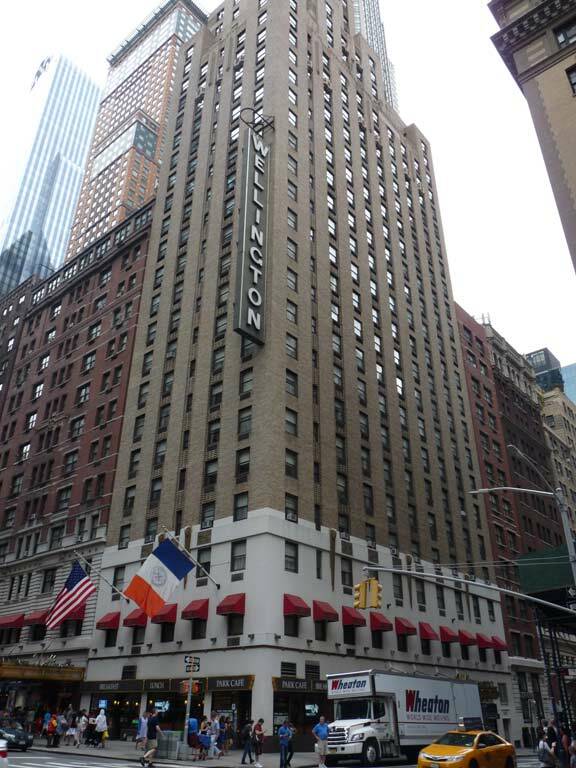 The Hotel Wellington was built in 1902 at the NE corner of West 55th and 7th Avenue, and has served under that name for 115 years and counting. The marquee seen here is lit in multicolors after the sun sets. 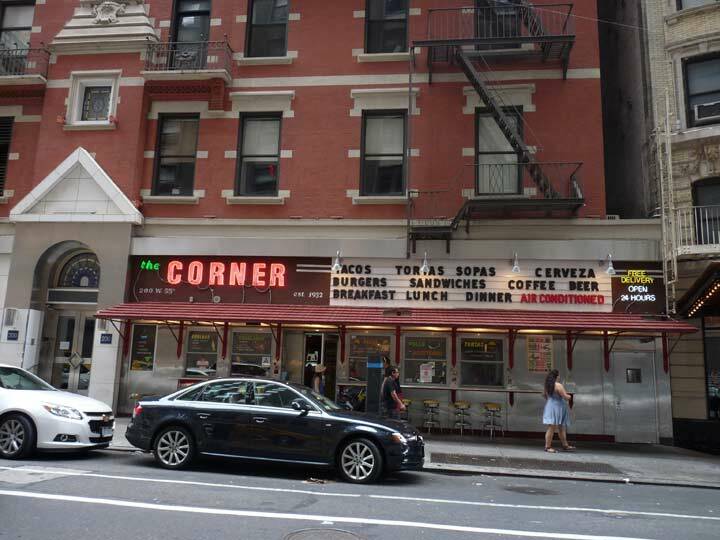 Speaking of marquees here’s an unusual one for the Corner restaurant, 200 West 55th Street in an otherwise residential building west of 7th Avenue. Street View from 2016 shows this location boarded up, while previous views from 2009-2014 show it as a white-paneled building entrance with potted plants. Therefore, since the sign says “est. 1932” it must have moved here from elsewhere. It turns out that this is a downtown branch of La Esquina at Kenmare and Lafayatte, which also has a movie theatre-style marquee on its building. I cannot readily explain the “est. 1932” except that that odd-shaped plot at Kenmare and Lafayette may have had a diner-style business there all these years. 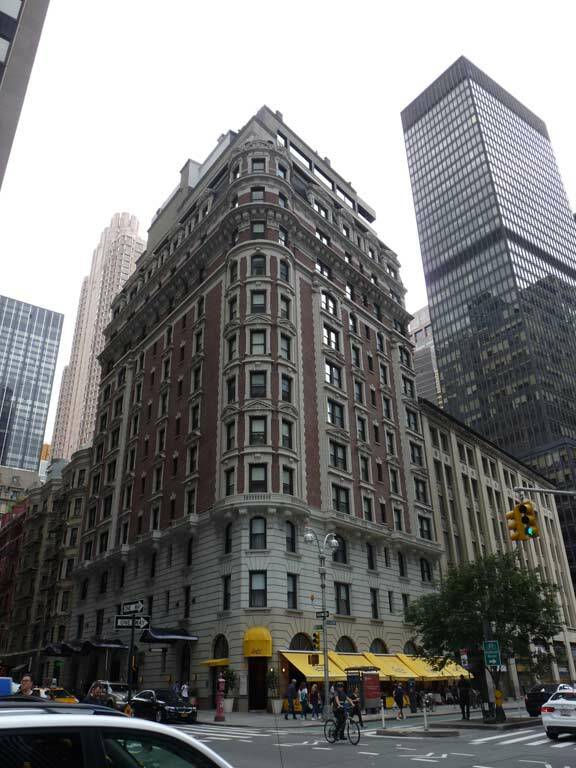 The Woodward Hotel was built on the southwest corner of Broadway and West 55th in 1895; it has subsequently been called the Majestic and later, the Dream. A stark contrast between 2000s and 19-aughts architecture on 8th and West 55th. 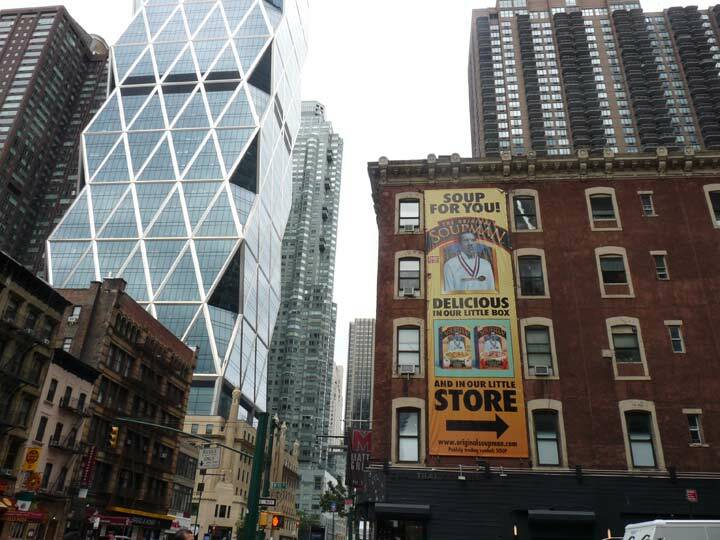 At left is the Hearst Tower, originally built at 8th and West 57th in 1927 and home to offices of publications associated with Hearst including Cosmopolitan, Esquire, Marie Claire, Harper’s Bazaar, Good Housekeeping, and Seventeen. In the early 2000s the original interior was gutted and a new, diamond-panelled glass tower designed by British architect Sir Norman Foster emerged from within the exterior shell of the original tower. 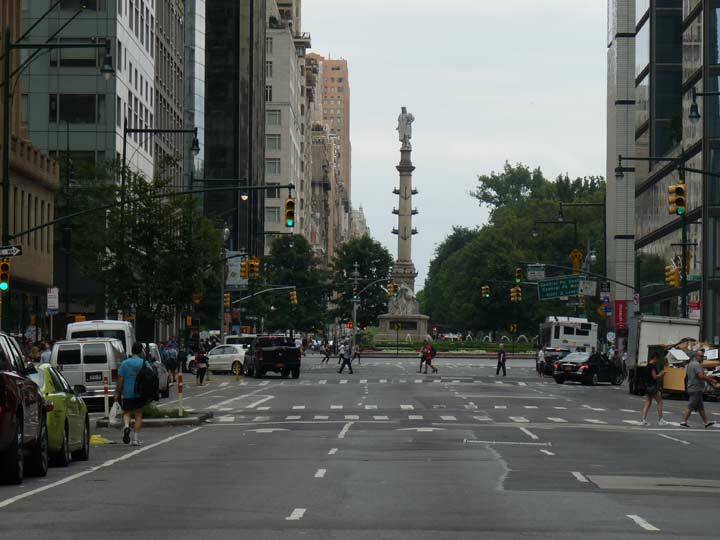 The Columbus Circle monument was installed in 1892, the 400th anniversary of Cristoforo Colombo’s arrival in the Western Hemisphere, and was sponsored by Italian-language newspaper Il Progresso. The marble statue, sculpted by Gaetano Russo, of the explorer stands atop a 70-foot tall granite column and is ornamented by bas-reliefs of the three ships Columbus captained, the Niña, Pinta and Santa Maria. The traffic circle came later, in 1905, designed by engineer William Eno. There is a possibility that the statue may be moved away from the circle (which could be renamed) as it has come under fire from progressive politicians because of Columbus’ role in the slavery, subjugation and deaths of Native Americans in the Caribbean. 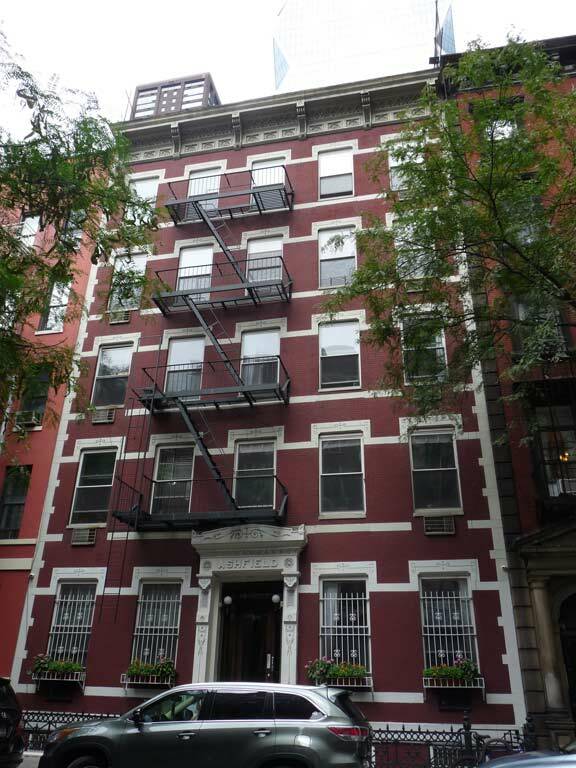 Handsome example of multifamily housing on West 55th between 8th and 9th Avenues, named by its builders The Ashfield. 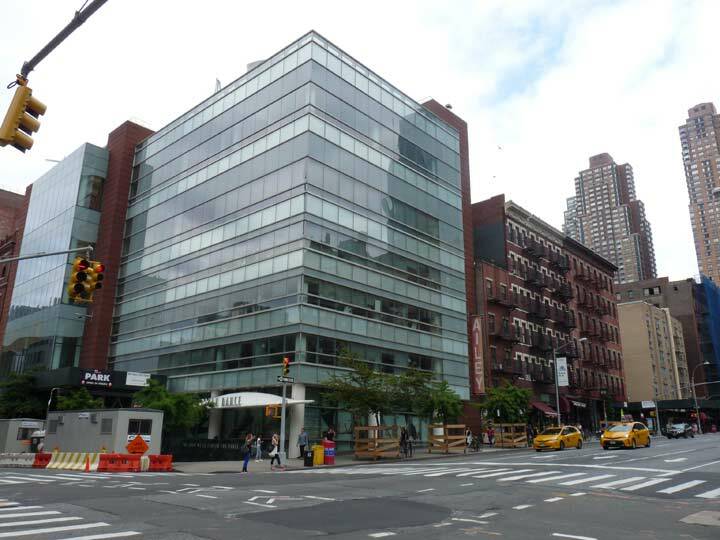 The glasss-walled building on the NW corner of 9th Avenue and West 55th is home to the Alvin Ailey American Dance Theatre. The company was founded in 1958 by the Texan dancer and choreographer (1931-1989). 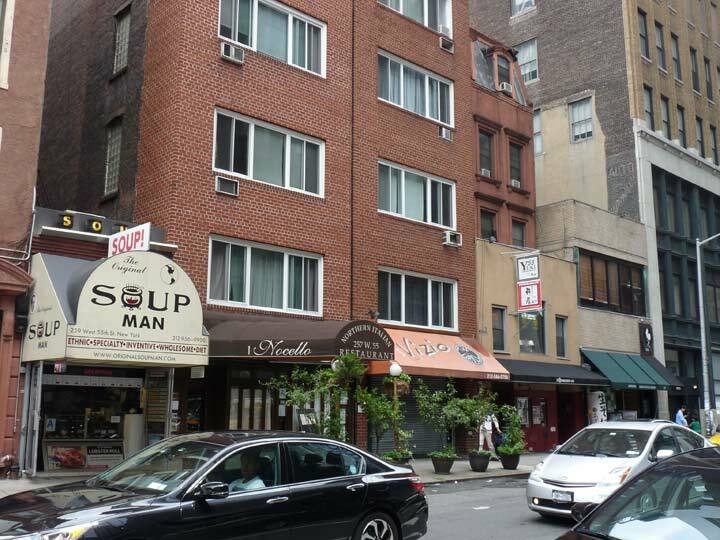 422 West 55th is a holdout of sorts on the 400 block between 9th and 10th. It still has its intact coal chute, which indicates it was formerly heated with anthracite. The building likely had sister buildings that looked like it on either side at one time. Here’s the largest over-street pedestrian bridge I’ve ever seen, spanning West 56th between 11th and 12th Avenues. It’s the Department of Sanitation HQ. 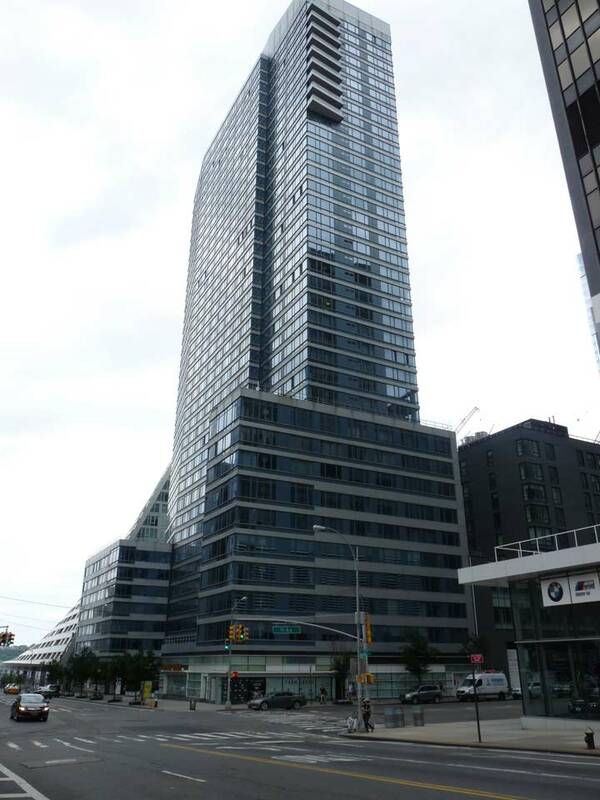 Another huge glassy residential tower, 601 West 57th at 11th Ave; known as The Helena. Behind it is the tetrahedonic 625 West 57th, a rare innovative NYC building design by Bjarke Ingels, home to what else, expensive apartments, though an 8-screen movie theatre will be built on the ground floor. 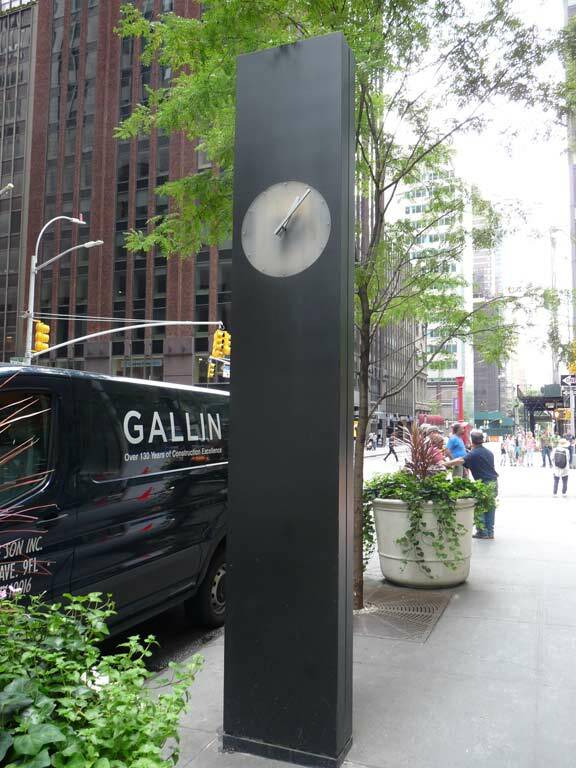 That will kick it in the head for my 55th Street walk– I got the bus back to the subway at 7th Ave. and West 57th from here. So-called “Native Americans” aka Berengians who arrived here via the Bering Strait usurped the North American continent from the original Caucasian European settlers, the Solutreans, who arrived first from northern Spain-southern France via the Atlantic Ice Bridge. Ergo, white people were the original settlers and the so-called “Native American” – not native at all – were the continent’s usurpers. So what does Columbus have to feel sorry for? He just reclaimed the Caucasian primacy. Including the killings and enslavement practiced by the so-called “Native Americans”. The conquistadores were astounded by the blood-thirsty HUMAN SACRIFICE savagery committed by the Aztecs upon fellow so-called “Native Americans”. Do the leftists mention that? Bottom line: Columbus and the Spaniards started the introduction of Western civilization in the face of savage behavior. Hey George the Athiest, Your version of events can be labelled as REVISIONIST HISTORY. Kevin’s correct, it was par for the course when it came to conquering. A possibility that “Martin” could have been from Martin Paints, a large chain a few decades ago. White supremacists grabbed this before the DNA evidence as proof that white people are, I don’t know what, first at everything? Christopher Columbus was born in the republic of Genoa but spoke Castilian. There was no Italy then. He wrote in Spanish and Castilian in all his personal correspondence to his family and signed his last name Colon not Columbus. One theory is that he used “Columbus” to hide his pirate background. That statue should come down on the basis of bad history if nothing else. Maxfield Parrish’s “King Cole” was originally installed in the new (1906) Hotel Knickerbocker on 42nd Street. 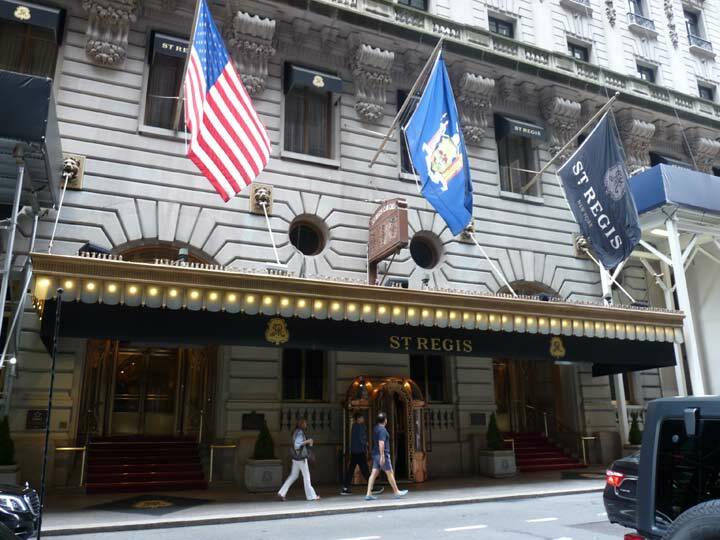 After being removed (the hotel was going to be renovated into an office building), the painting wandered around for a few years before finding its long-time home at the St. Regis. 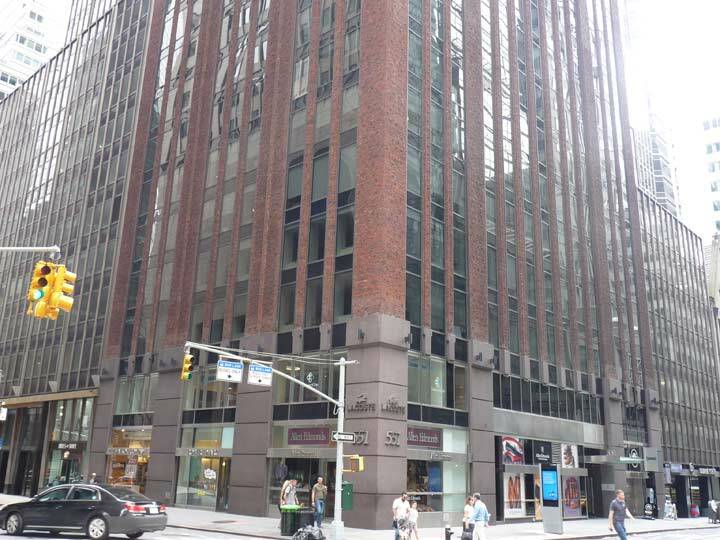 My then-fiancee, now wife, lived at 360 West 55th in the mid-80s when we met. Her apartment overlooked the old A&P, which accepted bottle and can returns all night long. There was also a guy, then homeless but obviously with some electrical skill, who had hardwired a small TV to the lamppost on the corner so he could watch Johnny Carson. Your picture of the Ferrari Store reminded me of when I would take my lunch hours (ca. 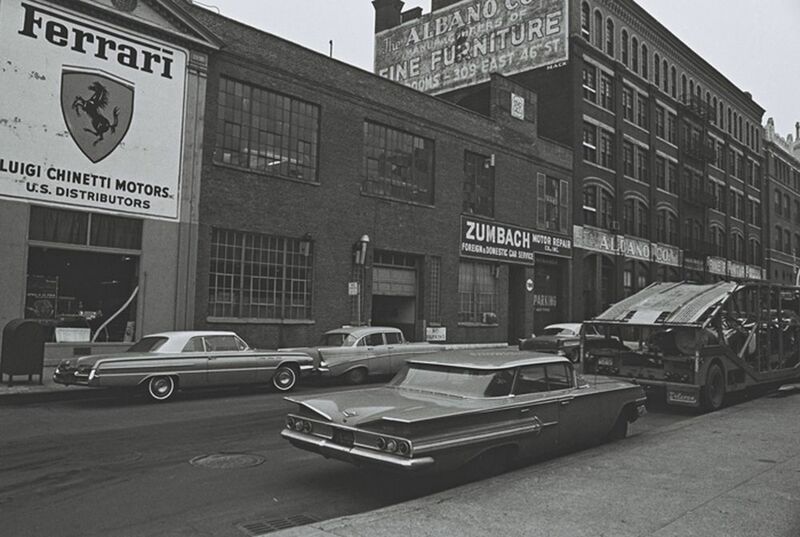 1963-4)to walk over to 11th Ave. and 49th ST (IIRC) to see what was then the only Ferrari dealership in New York, Chinetti Motors. As an auto and racing enthusiast Ferrari cars were well known to me as was Luigi Chinetti a winner of the LeMans race who was Ferrari’s distributor for the eastern US. Back then it was extremely rare to see a Ferrari so it was worth while for me to walk over to the far West side although I generally saw only a glimpse through the dirty windows and slightly open doors of what looked like an ordinary gasoline alley shop. Any Kia dealership the looked that crummy now would be quickly terminated. Chinetti Motors has long since moved to Connecticut. Great post, Andy. Good to see that you’re also a Hemmings subscriber. One of the Hemmings editors, Walt Gosden, frequently posts on FNY, too. You’re in good company. Your comment on the Hearst Tower is somewhat misleading. There never was a tower to gut in the original structure, just the six story base of the original building. There was a plan for a tower in the design, but it was never carried out, at least not for several decades. The wikipedia article tells the story. I’ve been told that the space the Ferrari store is in was designed by Frank Lloyd Wright. I used to work on the next block. That’s not DSNY’s actual HQ. That’s the M4/M7/M4A Garage which relaced the relic garages that were once there.